This blissfully serene graveyard sits, tree-surrounded, in the backroads of north-east Suffolk. The church is open every day, making it a wonderful goal for a pilgrimage, or quiet spot to rest for a passing stranger. 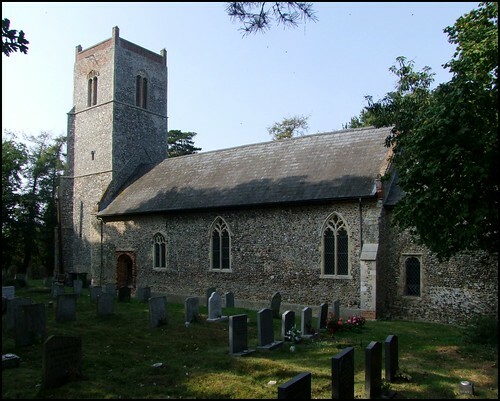 And it contains one of the great treasures of medieval Suffolk, as we shall see. The chunky tower and long chancel are rather deceptive, since this is actually a very small church; it is basically a single-cell Norman church that has been enhanced. At the time of White's Directory in 1844 the church was thatched. Very few Norman features survive in the fabric now, although there are windows from just about every period. The most striking external feature is probably the Tudor-rebuilt south doorway, which retains its original door, although it is now blocked off within. The doorway is barely four feet six inches high, but on the inside it has a tall Norman archway. Weston is blessed with one of the thirteen surviving Seven Sacrament fonts in Suffolk. None of the others in the county, even Badingham, are in such a tiny church, and consequently it feels rather as if the church has been built around the font. It sits on a very high Maltese cross which is probably the original, but appears to have been recut - the shaft to the font does too. The Rector tells me that the height of the font and its narrowness makes baptising a baby in it a rather perilous experience. Although the panels are badly mutilated, this font isn't in the terrible condition that Mortlock suggests, and all except the Last Rites panel are easily decodable. With the possible exception of the one at Melton, the Weston font is probably the least known of the Suffolk series. And yet, this church has a number of other has many other fascinating details. The bench ends are probably by the same artist as the ones up the road at Redisham. At the east end on the south side is a very fine bat-winged dragon, and the south side also features a now-headless friar preaching from a pulpit - his text hangs beside him. But it is the carvings on the north side that are particularly fascinating. What appears to be the back half of a lion balances a medieval cooking pot on his back. A similar carving survives in more complete form at Redisham, where it is revealed as a dragon, who is leaning back to lick out the pot. Mortlock suggests that it might illustrate the legend in the bestiary about a group of sailors shipwrecked on an island. They light a fire to cook food, whereupon the island awakes and shakes them off - it was a whale all the time. As Mortlock wryly observes, the medieval carver here had never seen a whale, but he knew very well what a dragon was. Also on this side is a stubby little post-mill, with a stairway leading up into it. Unsurprisingly, over the centuries it has lost its sails. When Pevsner came this way in the late 1950s he found this bench up in the chancel. The only bench end remaining of note up there now is one of a priest at a prayer desk, a bit like the one at Stowlangtoft. Not content with a fine font and bench ends, Weston also has some surviving fragments of wall paintings. These are on the south side, and show Christ's entry into Jerusalem, rather like the ones nearby at North Cove. Underneath is a later improving text, added by the Stuarts perhaps to encourage us all. There are two more of these elsewhere in the church. A roundel of continental glass depicts Christ in the garden at Gethsemane. One Stuart survival that is remarkable is one of Suffolk's only three surviving James II royal arms; as is often the case, the lion and unicorn are undoubtedly masculine. Rather paling into insignificance opposite is a very primitive decalogue, probably done locally towards the end of the seventeenth century. It bears examination, if only because of the calligraphy. This simple, pretty church is full of interest, and deserves more visitors. If you come here, don't miss the gravestone that Mortlock notes in the north-west corner of the churchyard. It is to five Sarbutt children, who died within two weeks of each other in 1896. They were probably descendants of George Sarbeth, who was church clerk here half a century earlier.